While the south side of the Dingle Peninsula tends to get more recognition, there is an entire north side of the peninsula begging to be explored. Colorful villages, expansive beaches, an enchanting forest, rivers, lakes, and islands bespeckle the north shore of Dingle Peninsula. 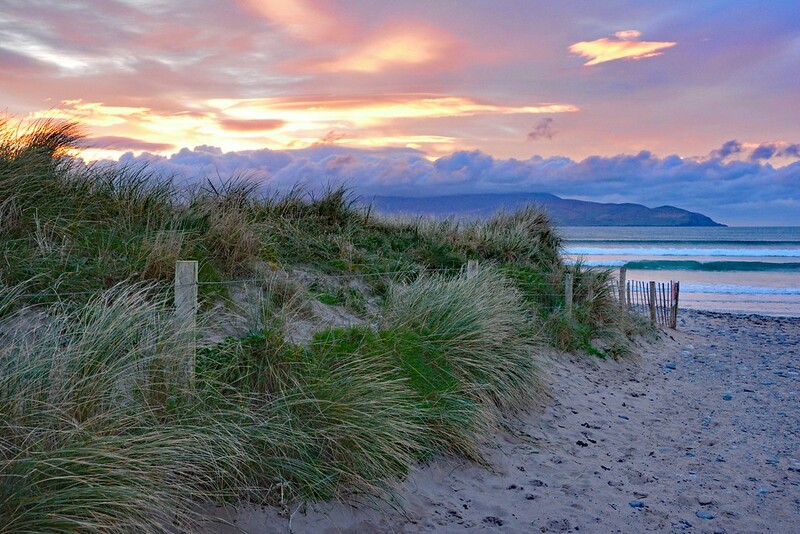 The villages of Kerry’s Gold Coast include Castlegregory, Stradbally, Aughacashla, Camp, Cloghane, and Brandon. 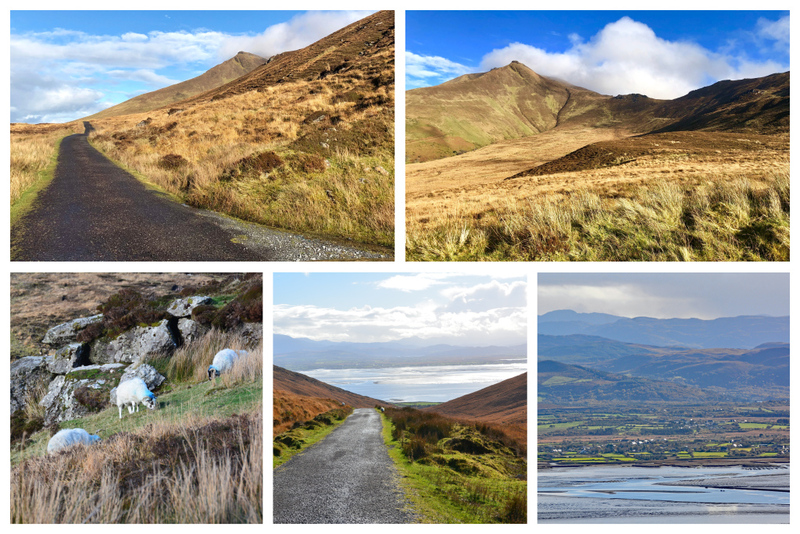 Instead of turning around at the peak of Conor Pass, one of Dingle Peninsula’s most popular mountains passes, keep going to discover the quieter north shore! Between our Guide to the Dingle Peninsula post, our Slea Head Drive Guide, and this post, you should be all set with planning your visit to the Dingle Peninsula in Ireland. 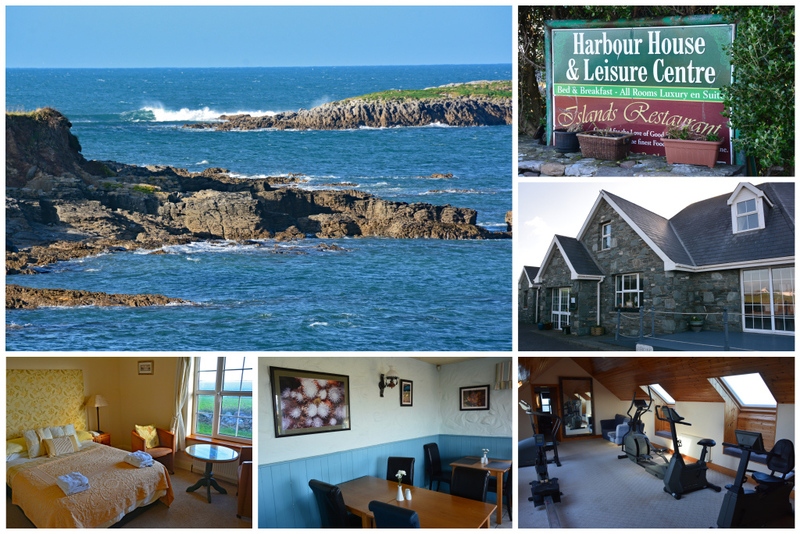 And if you’re looking for accommodations on Dingle, be sure to check out this post and scroll all the way to the bottom of this post for north shore recommendations. 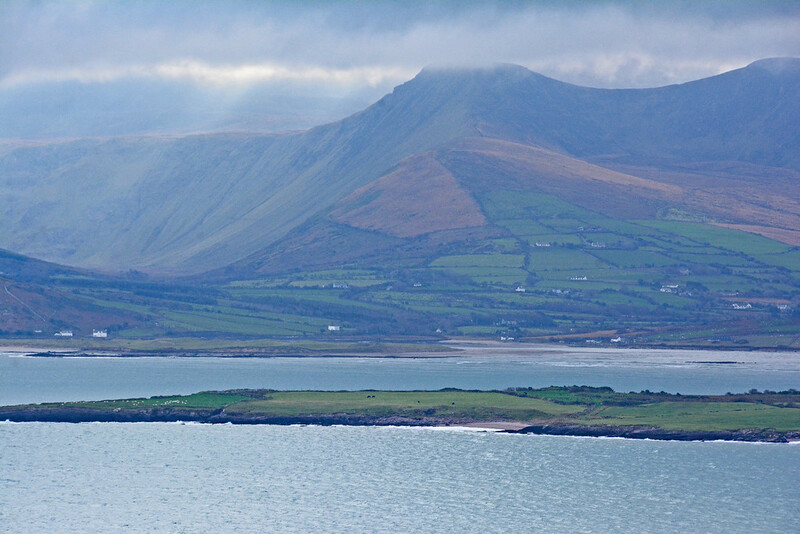 Once considered the capital of the north shore of the Dingle Peninsula, Castlegregory still serves as a central hub for the region. 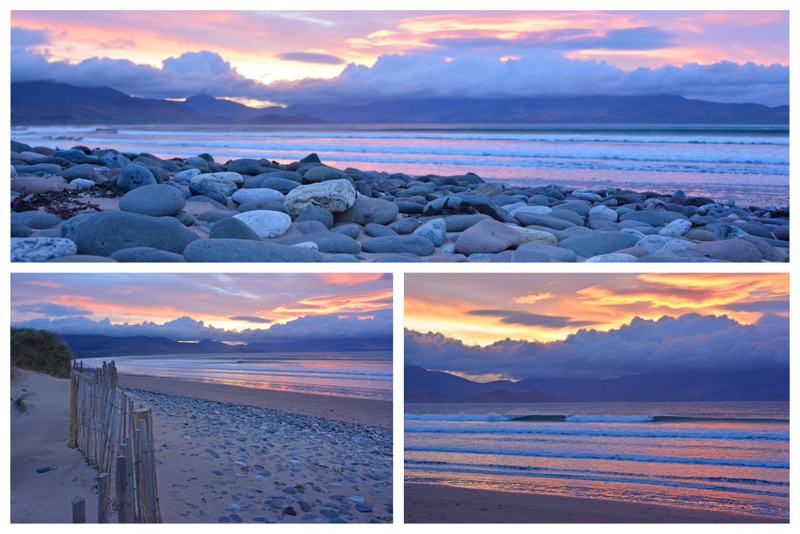 The drive from Dingle to Castlegregory takes just under 30 minutes. This tiny village has the basics – a petrol station, post office, grocery store, pharmacy, and of course, a few pubs! Stop by the Castlegregory Information Centre (Ionad Eoláis Caisleán Ghriaire) near the Spar (grocery store) to pick up a free information booklet, compliments of the Castlegregory Community Council. This free booklet is chock full of interesting facts about the area, along with details on local accommodations and activities. 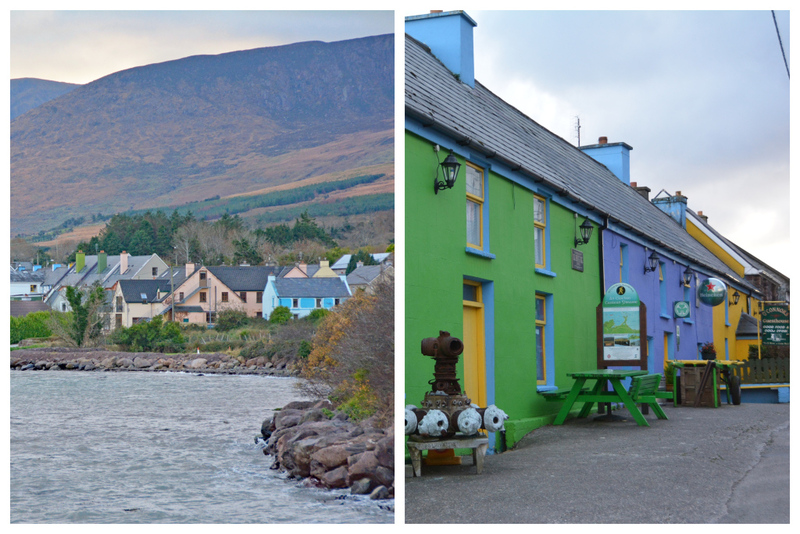 We regrettably didn’t take too many pictures in the village of Castlegregory Ireland itself. We were simply too enamored with the captivating and peaceful surroundings. The scenic lakes, seemingly endless shorelines, mystic dunes, ancient ruins, and wild horses captured our hearts. 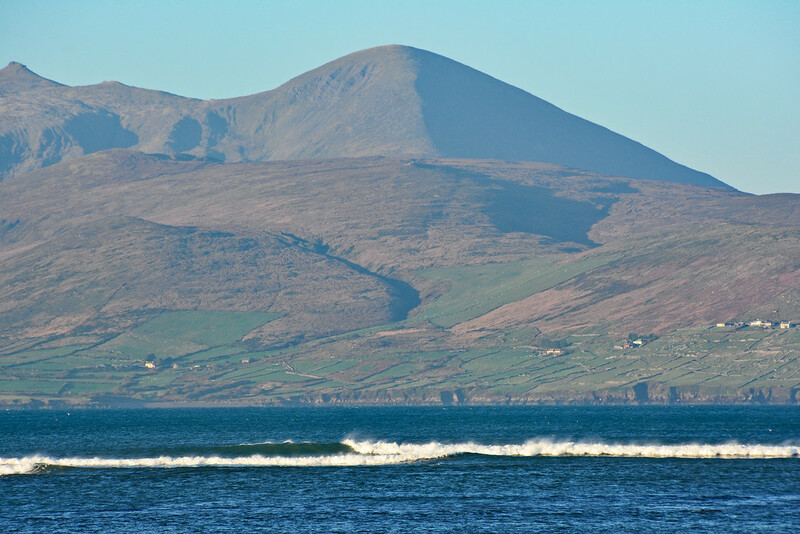 With all of this coastline, it’s no wonder Castlegregory is the watersports capital of Ireland! 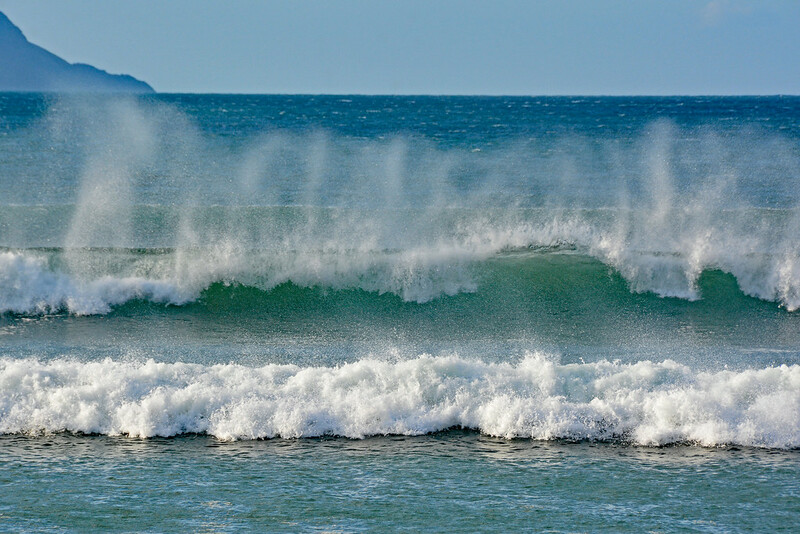 Continuous off-shore winds create swells in and around Brandon Bay making it the perfect location for adventurous water sports. To rent surfing, kayaking, paddle boating, stand up paddle boarding, and windsurfing gear near Castlegregory Beach, give Jamie Knox Watersports (+353 66 713 9411) or Splash Watersports (+353 87 2778236) a call. No matter the time of year you visit, you’ll definitely want a good wetsuit for enjoying the chilly and wild waters of the Atlantic! 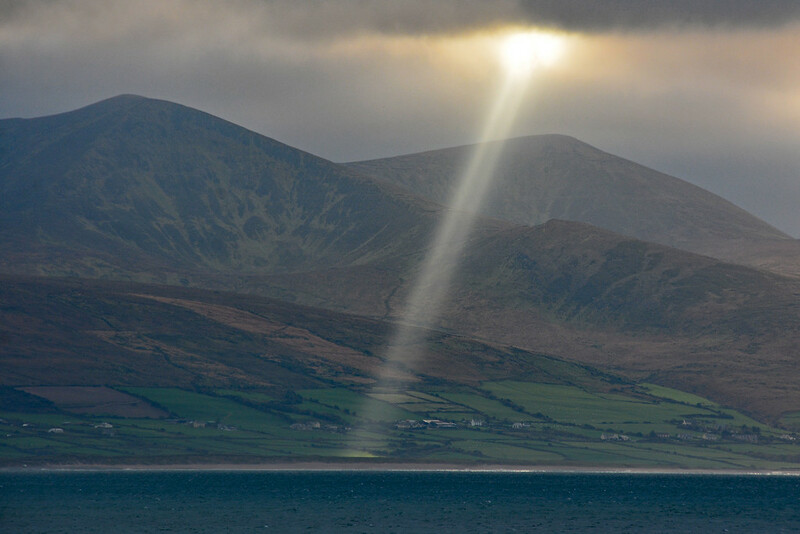 World-famous underwater explorer Jacques Cousteau concludes that “some of the best diving in the world is at the Northern side of the Dingle Peninsula where the Atlantic Ocean meet the Brandon Mountains“. Water temps average 62 degrees Fahrenheit (17 C) in late August/September, thanks to the Gulf Stream. On a good day, visibility can be 100 feet (30 m), averages 65 feet (20 m), and a not-so-great day offers about 23 feet (7 m) of visibility. 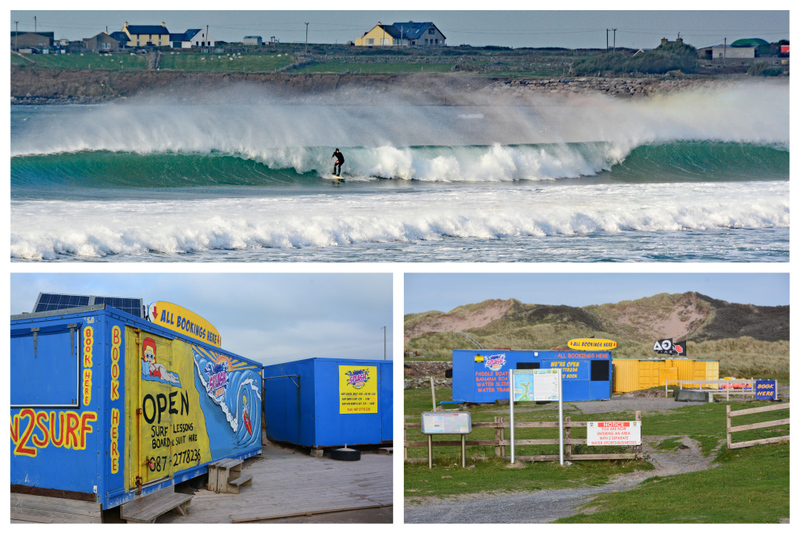 Harbour House (above) is home to Waterworld Dive Centre, Ireland’s leading 5-star International Dive Center. It’s also a bed and breakfast, which we’ll cover in more detail when we talk about Castlegregory accommodation in a bit. Nearby dive sites include “the 7 Hogs”, Brandon Cliff Face, and the Blasket Islands. The Maharees has its own resident pod of playful dolphins, while the nearby island of Illaunnabarnagh has its own seal colony. Other sea life you may encounter on a dive includes plenty of fish, lobsters, crawfish, crabs, basking sharks, pilot whales, and a variety of sponges and anemones among the reefs. The Castlegregory Golf Club is a 9-hole, 5,876 yard, par 68 golf course situated at Stradbelly, just west of Castlegregory, between Lough Gill and Brandon Bay. The natural features of the course, along with the persistent coastal winds, may provide a challenge to some, but the scenery is nothing short of spectacular! Surrounded by stunning views of Mt Brandon and the nearby bay, you may have a hard time keeping your eye on the ball! 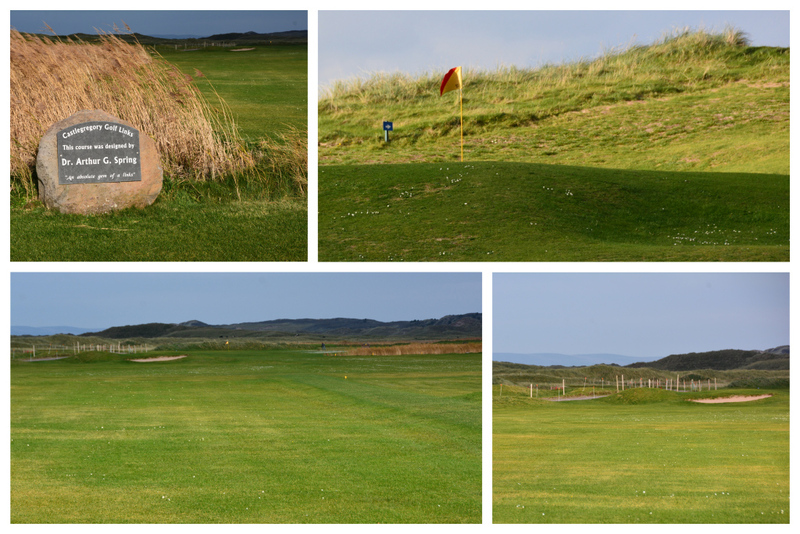 Contact the Castlegregory Golf Club clubhouse (+353 066 7139 444) to organize a round of golf. Into bird watching? If so, you’re in luck! Birds are abundant along the Dingle Peninsula north shore, especially during the winter. The warmer summer months bring about a large number of breeding colonies on the Maharee Islands, serving as the summer home to 13 seabird species. 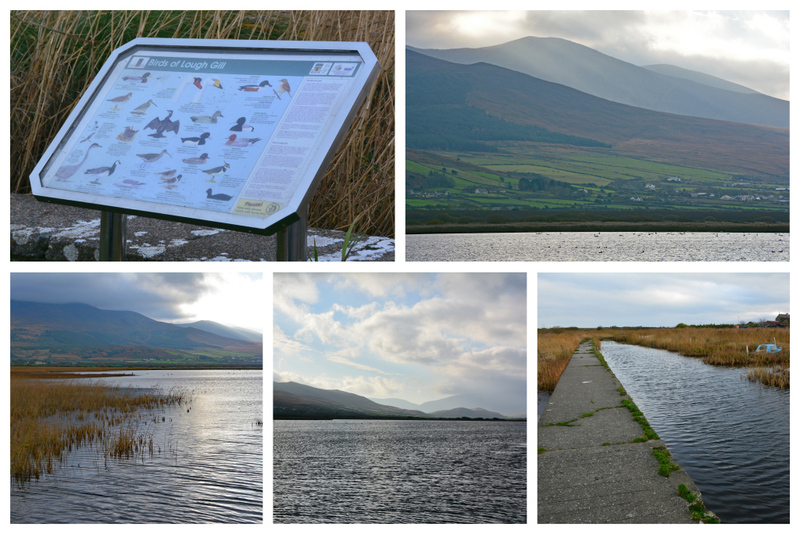 Visit Lough Gill, located just outside Castlegregory, and chances are you’ll see plenty of swans and ducks. You may also see migratory birds like mute swans and whooper swans, who visit from Iceland and Greenland October through April, along with tufted duck, teal, widgeon, and scaup. The southwest coast of Ireland is said to have the greatest variety in fish thanks to the warmer waters produced by the Gulf Stream. There’s certainly no shortage of places for shore angling (fishing) near Castlegregory. Catch mackerel off Brandon Pier. Fermoyle Beach and Rough Point (Kilshannig) are excellent locations for catching bass and flounder. From the beginning of February to mid-October, obtain a permit in Cloghane village to catch wild Atlantic salmon and sea trout in the Owenmore River. Be sure to visit the Fishing in Ireland website for information about fishing hotspots, regulations, and permits. There are some seriously talented individuals throughout the peninsula. In our Slea Head Drive post we highlight local artists such as Sean Daly, master craftsman behind Dingle Crystal and Louis Mulcahy who has been creating stunning pottery pieces for over 40 years. The talent continues on the northern side of the peninsula with local artists Syra Larkin and Michael Flaherty. 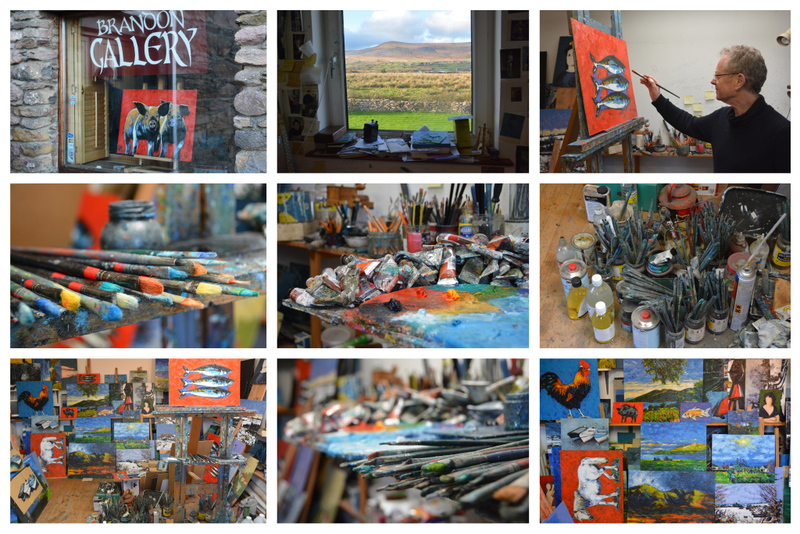 Syra’s Shoreline Studio in Castlegregory is packed to the gills with a stunning variety of her contemporary/figurative paintings and prints. Go to Syra’s website for contact information on how to make an appointment to visit her studio. Michael Flaherty uses vibrant colors to create spectacular oil paintings of local landscapes. Stop by his studio, the Brandon Gallery, to check out some of his work, and to see the surrounding area where he gets much of his inspiration. If your visit to Castlegregory falls during their annual summer festival, get ready to experience a fun-packed program! The Castlegregory Summer Festival, held second weekend in July, is one of the oldest festivals in the country (started in 1948) where locals and visitors come together to enjoy a variety of family entertainment. Activities include fancy dress parades, sand castle competitions, tennis competitions, dances, discos, treasure hunts, and a pet show. Restaurants all over the Dingle Peninsula pride themselves on using local sourced ingredients. This means you’re eating seafood right off the boat and produce straight from the farm! Spillane’s Bar and Restaurant in Castlegregory is certainly not an exception. For over 40 years now, Marilyn & Mike Spillane have been serving up delicious eats at their restaurant including crab claws, Cromane Mussels, homemade burgers, chargrilled steaks, and more! You can also find fresh seafood (and delicious desserts) at Islands Seafood Restaurant, located with the Harbour House (accommodation and dive center mentioned above). Looking for something laid back and casual? Head on over to Ned Natterjacks Gastropub and Whiskey Bar, named after the natterjack toad. This particular species is the only toad native to Ireland and can be found in Castlegregory. Enjoy Friday evening BBQs and Sunday jam sessions at Natterjacks and let the good times roll! One of the best ways to mingle with the locals is to pop into a pub. Enjoy a pint and a bite and soak in the local culture. 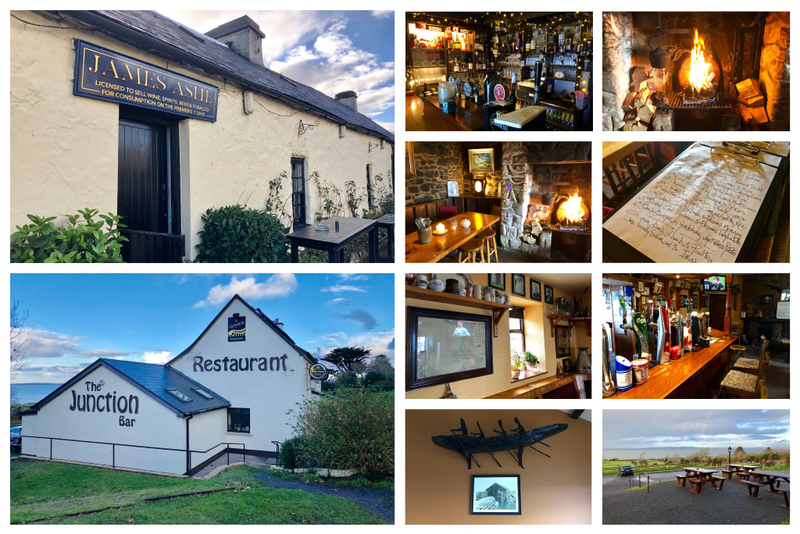 There many only be a handful of Castlegregory restaurants, but each is a great place for experiencing the local culture in this quaint little town on the north shore of Dingle Peninsula. 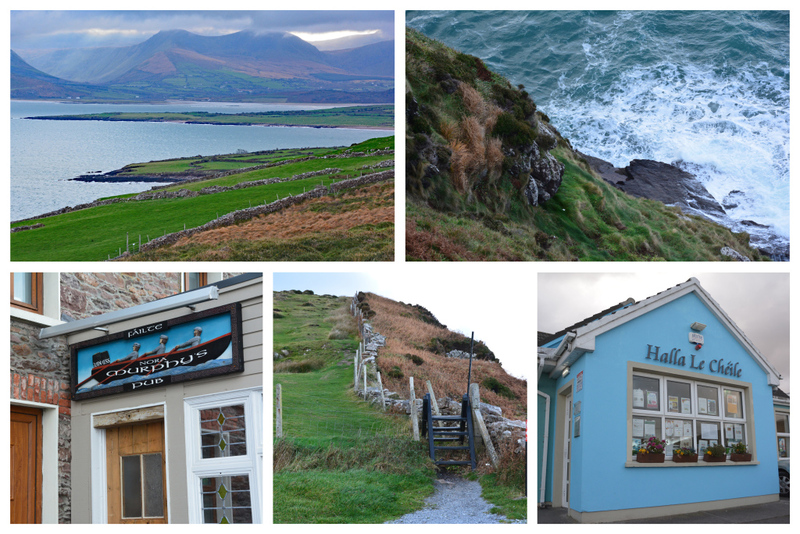 Lodging on the north shore of Dingle Peninsula may not be as abundant as accommodations in and around Dingle town, but there are still some great places to choose from if you plan on spending a few days in the region. As mentioned above, Harbour House near Castlegregory has 15 en-suite guest rooms, an indoor swimming pool, sauna, gym, and an award-winning restaurant, in addition to being home to Ireland’s leading 5-star International Dive Center. Spillane’s Bar and Restaurant not only offers steak and fresh local seafood, they also have Castlegregory holiday homes for rent. We stayed in one of their rentals across the street from the restaurant and WOW, the views over Brandon Bay cannot be beat! You can book one of their apartments on AirBnB*. Looking for a truly unique stay? 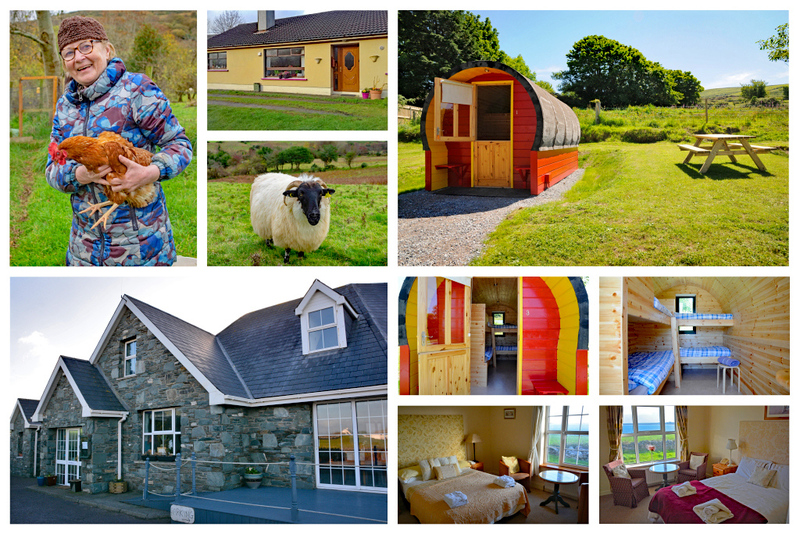 Book a room at Brigid’s Sheep Farm* or check out these glamping pods in the village of Camp. *Before booking on AirBnB, follow our -> unique link <- to sign up, so you can save big on your first stay! (This discount is only applicable to first time AirBnB users.) 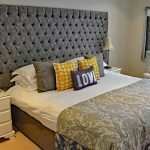 For more ideas on places to stay, check out this post where we highlight some of Dingle’s best hotels and other accommodations around the peninsula. To the west of Castlegregory are the quaint villages of Cloghane and Brandon, where you will still hear the Irish language spoken by the locals. Cloghane overlooks the Owenmore Estuary and is a picturesque village made up of stone houses, a bakery, a local shop (Siopa Phobal), a church, a bar, and a guesthouse. 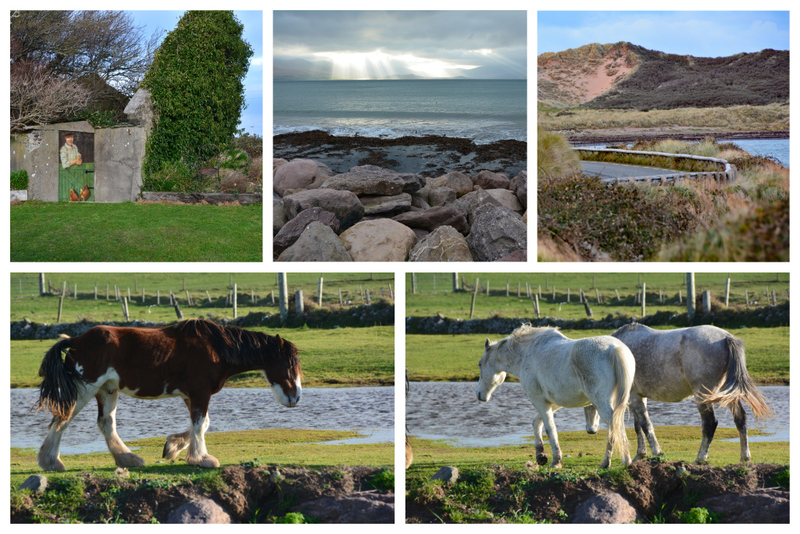 Seriously, what more could you want in an idyllic little Irish village? Brandon Ireland is a charming fishing village (complete with a fishing pier) overlooking Brandon Bay. For outstanding views, drive or walk on out to Brandon Point (Srón Bhroin), a Discovery Point on the Wild Atlantic Way. From here, you can see one of Ireland’s longest stretches of beach which goes from Cloghane out to the Maharees. While in Brandon, duck into Murphy’s Bar for a pint and be sure to tell Pádraig we said “Hello”! 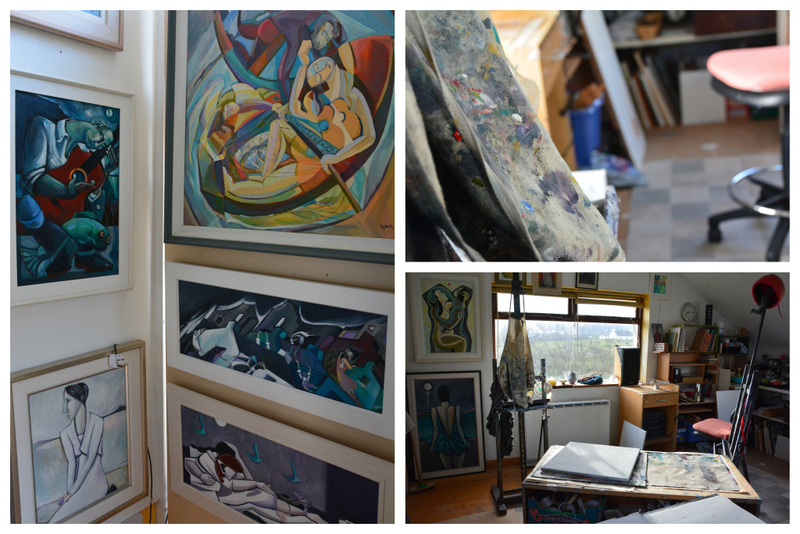 Pop into the studio of local artist Michael Flaherty. He has some wonderful paintings of the surrounding area. Also in the town of Brandon is the local community center, Halla le Chéile. A Meals on Wheels program provided by the center ensures that elderly residents within the community are taken care of. In addition, each Tuesday the center picks up local residents via bus, brings them to the center, and hosts a community meal. Small towns and villages are what makes up the wonderful Dingle Peninsula and a great sense of community can be felt throughout the peninsula. Another example of this togetherness is demonstrated during Feile Lughnasa. Cloghane and Brandon invite locals and visitors alike to participate in this 4-day summer (July) festival to experience the old Irish tradition of celebrating the Lughnasa, a Celtic harvest festival dating back 2,000 years. Festival activities include music, children’s activities, a poker tournament, paddle boarding, swimming races, sand castle building competitions, hill walks, and stage dramas. 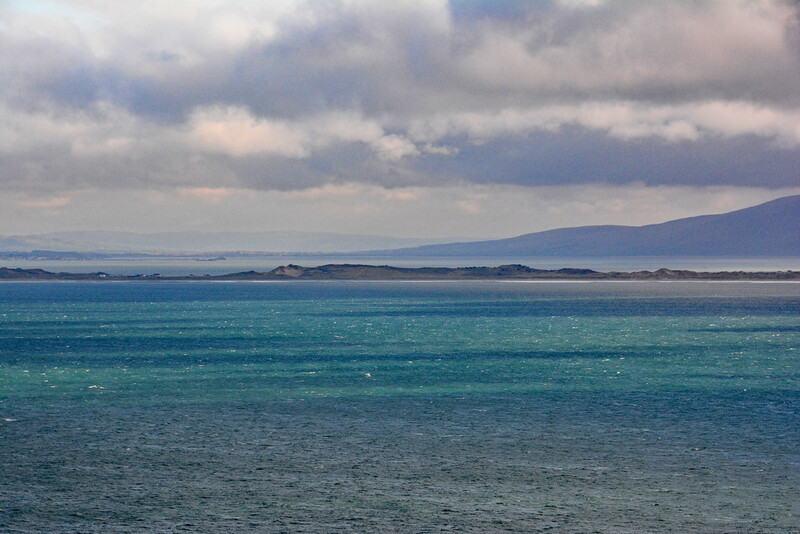 Feile Lughnasa is also a great time to experience local traditions, such as sheep shearing, the blessing of the boats at Brandon Pier, and a pilgrimage to the summit of Mount Brandon. 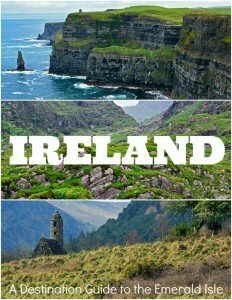 Hopefully visiting Ireland isn’t just about seeing the sites for you. Be sure to make time to experience local culture and traditions, for these are the memories that will stick with you long after you return home. Camp Ireland, located 12 miles west of Tralee, is considered to be the gateway to the Dingle Peninsula. Though blink and you might miss it, there’s a lot of history and personality packed into this tiny town! An unfortunate tragedy is what the town of Camp may be best known for. In 1893, a train derailed off the Curraduff Bridge in Camp killing 3 and injuring 13. A stone monument, erected in 1993 (100 years after the crash), can be found near the remains of the bridge. Just down the road from the Railway Tavern is Fitzgerald’s Junction Bar and Restaurant. The train used to stop right across the street from this 4th generation bar. This is a wonderful place to stop for a hearty meal or to simply grab a pint. The outdoor seating area overlooking Tralee Bay is the perfect place to relax on a crisp and sunny day! The third pub in Camp, Ashe’s Pub, is located just about a mile from the other two. It too is a great place to enjoy some upscale pub grub and a pint in a cozy and welcoming setting. 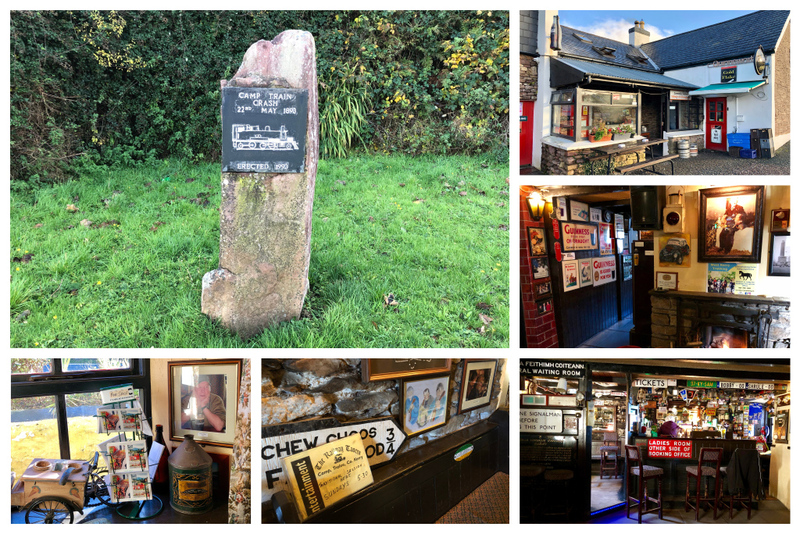 This 4th generation pub has been around for over 180 years and is now run by Thomas Ashe, another friendly local with a myriad of stories to tell. 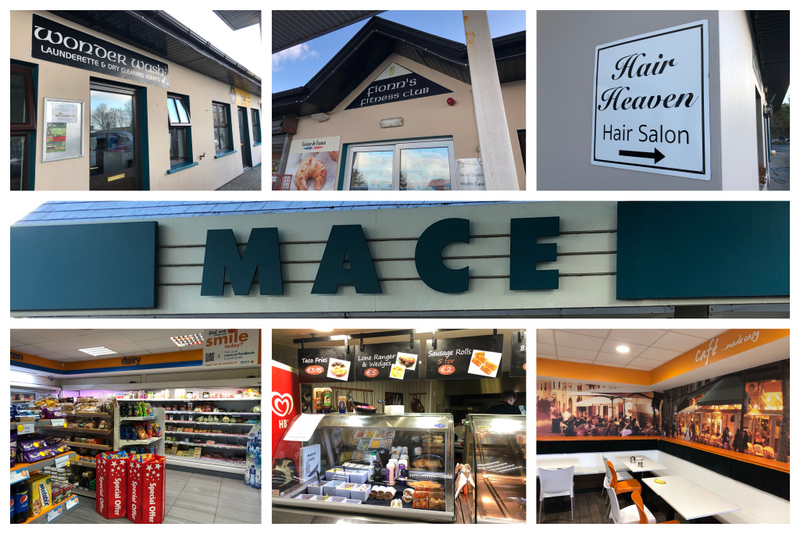 The village of Camp is also home to MACE, a small, but complete super center with convenience store (including deli), car garage for auto repair, hairdresser/beauty salon, laundromat, gym, health center (w/ doctor), car wash, and business center. It looks so unassuming from the outside, but it truly is a one-stop shop! 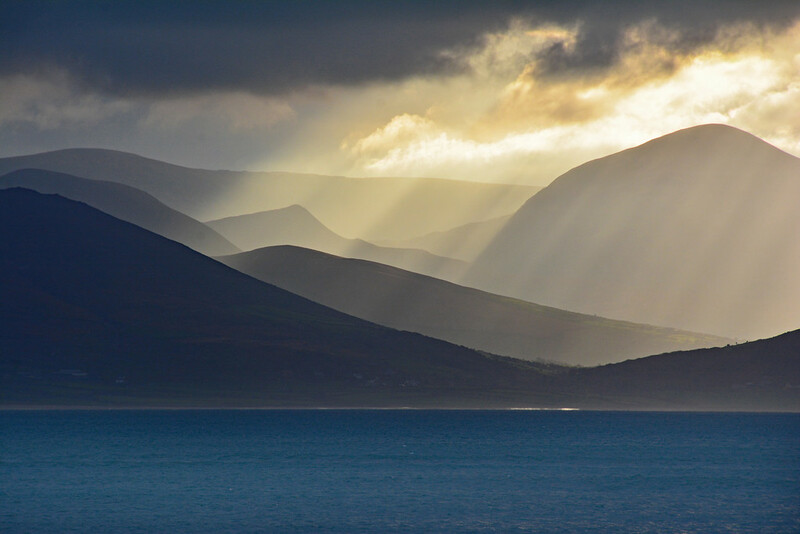 Since Camp is the first stop on the multi-day Dingle Way hike, hikers are able to take full-advantage of the wonderful services, pubs, restaurants, and accommodations found in this little hub on the Dingle Peninsula’s north shore. Time your visit to Camp right and you’ll be able to partake in one of its many events throughout the year, like the Camp Sheep Fair in September (a long standing tradition), in addition to vintage car rallies like the Reindeer Run, held after Christmas each year. Sure, driving is a great way to experience the Dingle Peninsula, but if you’re feeling extra adventurous and want to experience the peninsula with all of your senses, take a hike! Hundreds of miles of trails wind throughout the peninsula, ranging from casual coastal strolls to strenuous mountain ascents. 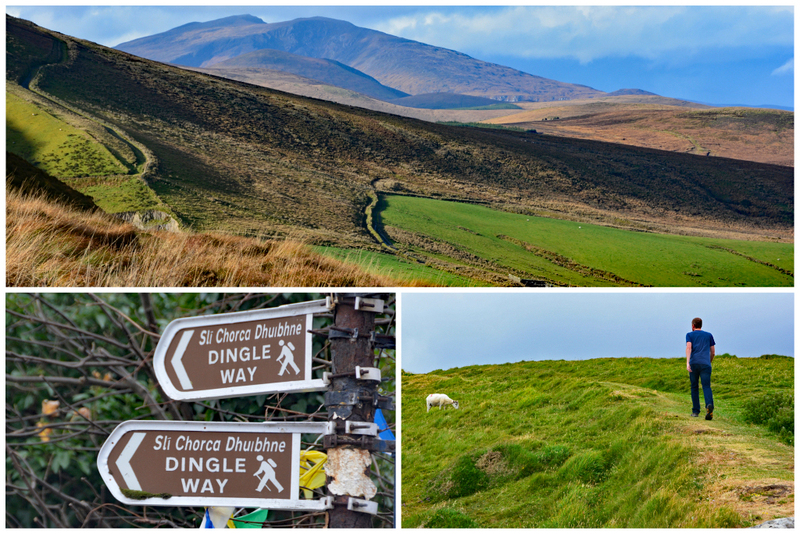 The peninsula’s most popular hike is the 111-mile (179 km) Dingle Way. This circular route starts and ends in Tralee and covers a good portion of the north side of the peninsula. Walkers can, of course, do portions of the Dingle Way without completing the entire route. For Cloghane and Brandon walks (ranging from easy to strenuous), pick up a guide book at Halla Le Chéile (Brandon community center) or in Siopa Phobal (Cloghane local shop). For a fairly strenuous hike along the north shore, set out to conquer the three peaks of Stradbelly Mountain (789 m/2,588 ft), Beenoskee Ridge (826 m/2,709 ft), and An Com Ban (610 m/2,001 ft), a 16 km/10 mile hike in total. 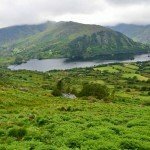 For an even more adventurous challenge, make the climb up Brandon Ridge (15 km/9.3 miles), including Drom na Muic (Pig’s Back – 750 m/2,460 ft), Brandon peak (840 m/2,755 ft -the second highest mountain in Ireland), and Gearhane (803 m/2,634 ft). However, if you’re looking for a more casual walk on the north shore, consider the Maharees Heritage Trail. Pick up a brochure/map of the trail at the information center (Ionad Eoláis Caisleán Ghriaire) near the Spar grocery store in Castlegregory. This leisurely stroll will take approximately 2.5 hours. It begins at the Sandy Bay (Beal Geal) car park, continues around the village of Kilshannig and along the beach at Scraggane Bay. You’ll then pass through Fahamore Village and head to Point Gap. From there, continue along the beach to Maherabeg Cut and make your way back to the Sandy Bay car park. Use your imagination as you stroll past sites where many historical happenings and shipwrecks took place. Loch a’Duin (The Lake of the Fort), a valley that lies in the shadow of Conor Pass, contains a series of eighty-nine monuments (wedge tombs, standing stones, rock art, etc.) dating back to the Bronze Age. This is one of the most significant ancient sites in all of Ireland and you can walk through this valley of history in about 3 hours. The valley also contains over 12 km of prehistoric pre-bog field walls dating to ~1300 BC. For more information about what you can expect to see on this leisurely historical walk, check out this detailed post. 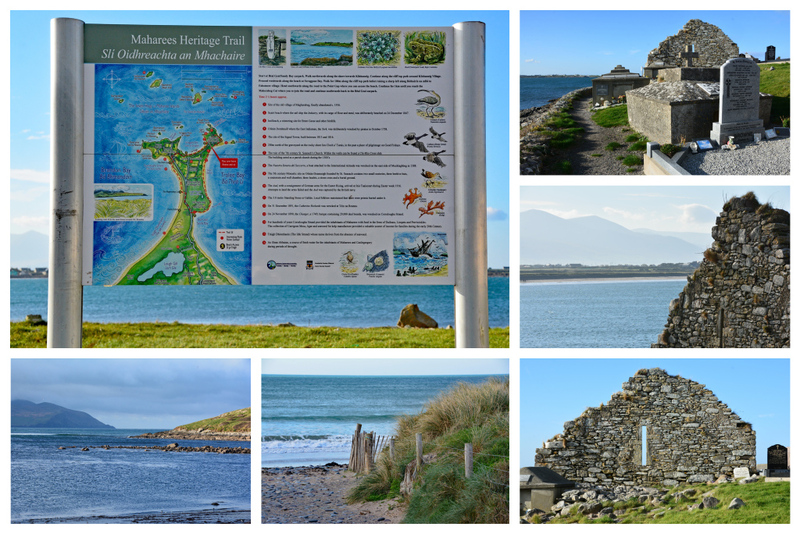 Dingle Peninsula is home to over 2,000 archeological sites, many of which can be found in and around the Castlegregory area. About a mile and a half (2.5 km) east of Camp, you’ll find Killelton, a medieval church/oracle and national monument dating back to about the 9th/10th century. Thoughts of the Dingle Peninsula typically stimulate images of ragged coastlines and miles-long beaches. However, smack dab in the middle of the peninsula is an enchanting forest complete with waterfalls and mountain lakes. Glanteenassig translates to the “Valley of the Waterfalls” and after a hard rain, you’ll see precisely why Glanteenassig Forest Park in Aughacasla was given this name. The 450 hectare area of woodland is located in a sheltered valley among the Slieve Mish mountains just 6 km from the sandy shores of Castlegregory. Lough (Lake) Slat is situated below the imposing hill of Doon and the majestic rock face of Carrigaspanaig. It is here that you will see the “valley of waterfalls” after an abundance of rainfall. 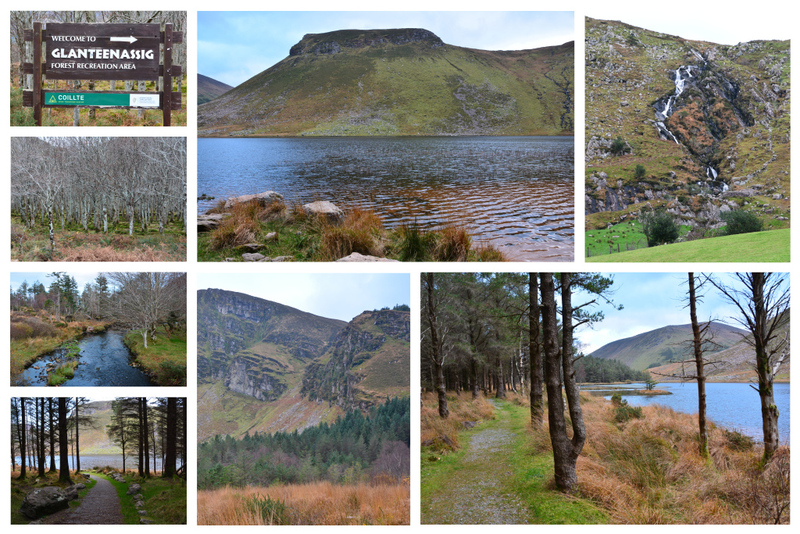 From Lough Slat, take the forest road and a short trail to the shores of Lough Caum. A boardwalk around the lake provides a moderate (1.8 km/1.1 mile) walk. 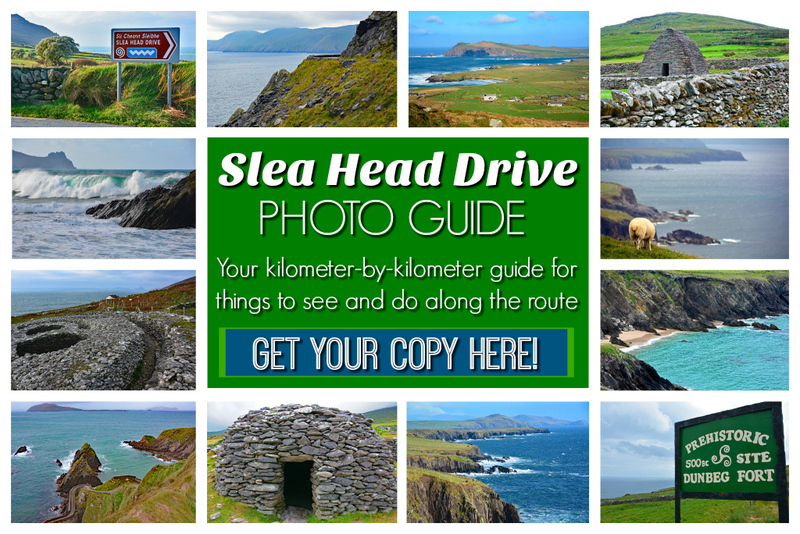 Slea Head Drive is the ultimate Dingle Peninsula road trip! 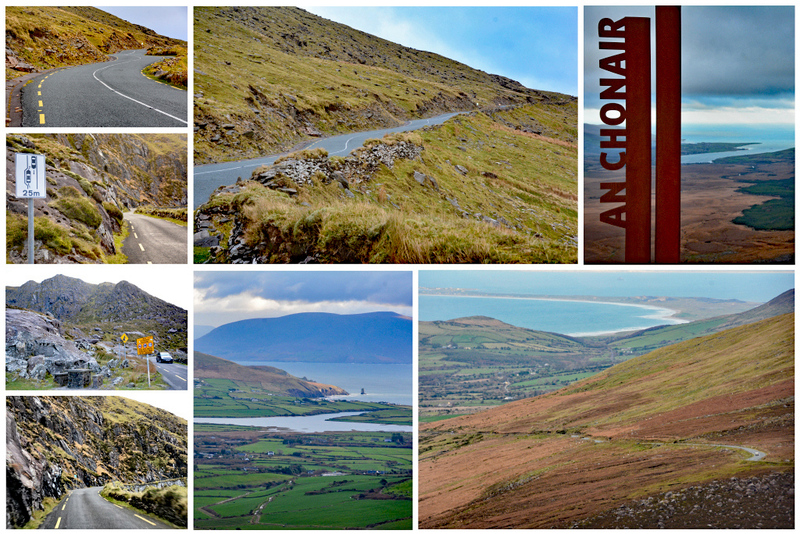 However, there are several other extraordinary drives found throughout the peninsula, such as Conor Pass. Ireland’s highest mountain pass (456 m/1,496 ft) was built around 1830 and it is not for the faint of heart! The pass occasionally becomes a single lane road, and because of this coaches are not permitted along the route. That being said, if you want to experience Conor Pass, you’re going to have to drive it yourself. It is important that when driving the pass you remember descending traffic has the right of way. So, when you’re ascending, use the designated turnouts and yield to vehicles coming down. On a clear day, the upper car park might just offer the best view on the entire peninsula. You’ll be able to see Cloghane and Brandon Bay down below, in addition to the south side of peninsula, including Dingle town and Dingle Harbor. There’s also a small car park (on the north side of the pass) with a waterfall fed by Pedlar’s Lake. From here you can see the 3 lakes in the valley and Mt Brandon to the far right. There’s another scenic, yet less-traveled, mountain pass connecting the south side (Aughils, near Inch Beach) to the north side (Camp) of the peninsula. While not as high as Conor Pass, Caherconree mountain pass (seen above) still offers excellent views over Dingle Peninsula and beyond. The winding, often one-lane, road climbs to 277 m/908 ft under the Fort of Conraoi (Cathair Conraoi). Mt Caherconree (the second-highest peak of the Slieve Mish Mountains) is named after this Iron Age stone fort which prominently sits 2/3 of the way up the mountain’s southwestern shoulder. The hike up to the fort is one of the best walking routes on the Wild Atlantic Way and offers outstanding views of Tralee Bay. On your descent (coming over from Camp), you’ll have splendid views of Castlemaine Harbor, Inch and Rossbeigh beaches, and Cromane. 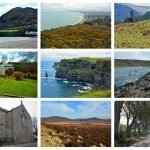 We truly hope that this post has been a great introduction to a lot of what the north shore of the Dingle Peninsula has to offer. Many visitors to the peninsula fail to explore beyond Slea Head Drive. It’s only after they leave that they realize just how much is left to be discovered. It took two visits to the peninsula for us to even make it over to the north side. We regret not doing so sooner. 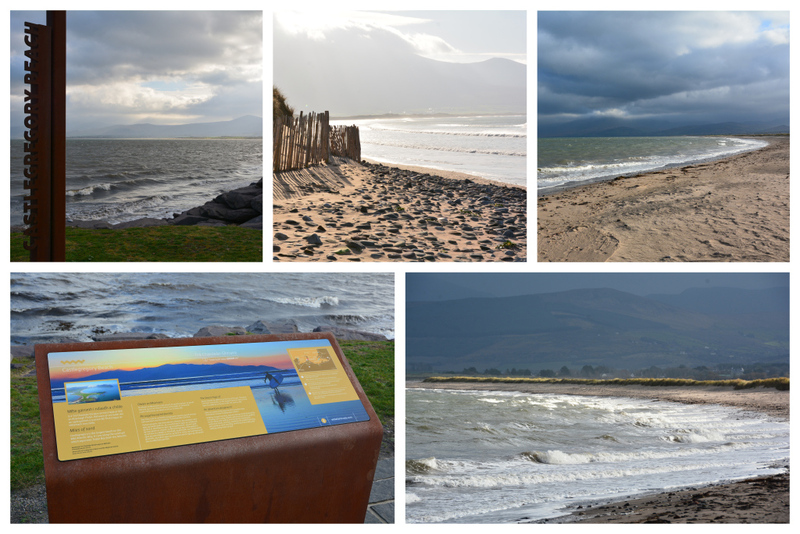 When we left, we vowed to put together a detailed write-up of what Castlegregory and the surrounding area has to offer. 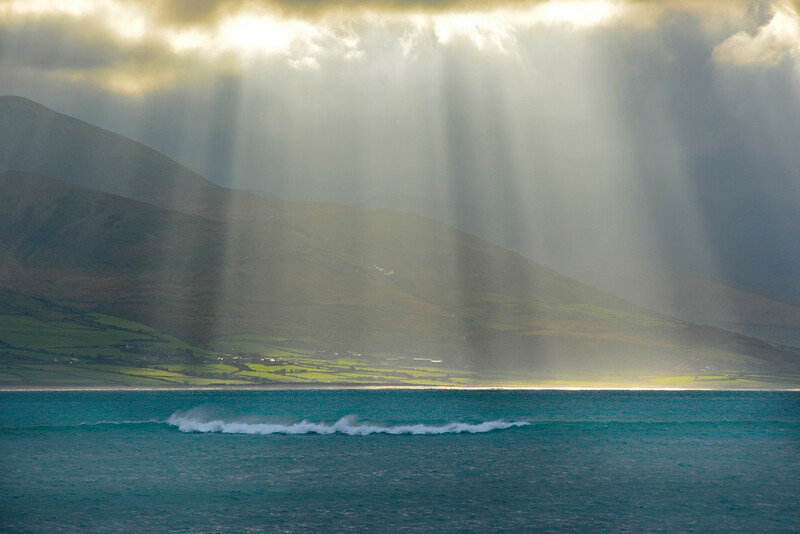 Our intention is to encourage others to not just drive Slea Head, to not just stop at the peak of Conor Pass, but to keep going and to discover the beautiful north shore of the Dingle Peninsula.